For a boating experience to be enjoyable, conveniences and amenities play a big role. 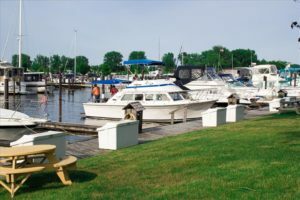 At Bay Harbor, you have your choice of floating or stationary docks. There are 458 slips for boats up to 70’. Dock fees include: power, water, and wi-fi. On the river, just minutes from the bay. Gas dock and party store. Pump out and a port-a-pottie station available at gas dock. Secured winter storage, outside, inside or heated available. Transient dockage up to 60'. Two complete bath house facilities conveniently located. Beautiful heated pool, along with complete sundeck and lounging area. A basketball court is available for your energetic side. The laundry facility is conveniently located in the bathhouse.